I recently purchased the Autocom Motorola Bike-To-Bike kit so that I can talk with my friends while riding. It has speakers and a microphone that velcro in your helmet, wires to connect to a radio and a nifty push to talk button that is supposed to mount on the handlebar grip. The radio just sits in a pocket in my jacket. Push the button and you can broadcast over the radio. It works really well and makes riding bikes way more fun when you can point out cool stuff to your friends. Unfortunately, this button gets in the way on the grip so I had to get creative and mount it elsewhere. 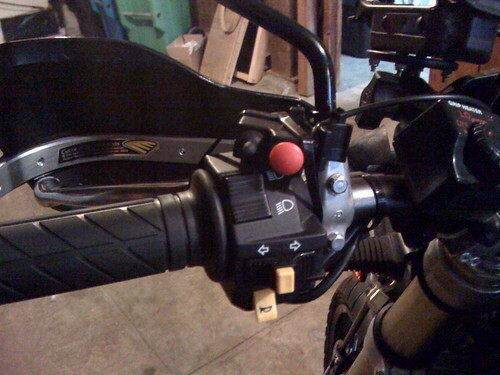 My bars are pretty tight for space so I ended up with the button ziptied on the top of the light/horn control box. This worked out pretty well and I like having this scary red button visible on the bars. Big things squish into small packages.